The islands are covered in Mediterranean coniferous forest and macchia vegetation such as the strawberry tree, the lentisc (Mastic tree), the phillyrea, the heather, the rhamnus, the kermes oak, often in a form of treelike shrubs, and evergreen trees such as the maple, the wild olive, the phoenician juniper, and the rare tree Amelanchier chelmea. Phrygana is also common and consists of many species. Of particular interest are the chamofytes with several endemic species such as Campanula reiseri, Linum gyranium, Arenaria phitosiana, campanula rechingeri etc. 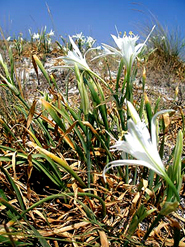 During summer, a small sea lily also named sea daffodil or lily of St. Nicholas grows in coastal sand dunes of Psathoura. But, take care not to cut it, because it belongs to protected species. Just let it give you its stimulating aroma. Underwater sea-grass beds of the seaweed Poseidonia are the ‘forests’ of the Mediterranean seabed. They grow according to the direction of the light, on sandy or muddy bottoms in the shallow coastal areas, at a depth of between 30 and 40 metres. The Poseidonia meadows are the largest marine producers of oxygen and biomass and the sea-grass is particularly important for the development of other organisms and the retention and cycling of suspended particles and various substances in the marine environment. Copyright 2019 Alonissos Museum. All rights reserved.